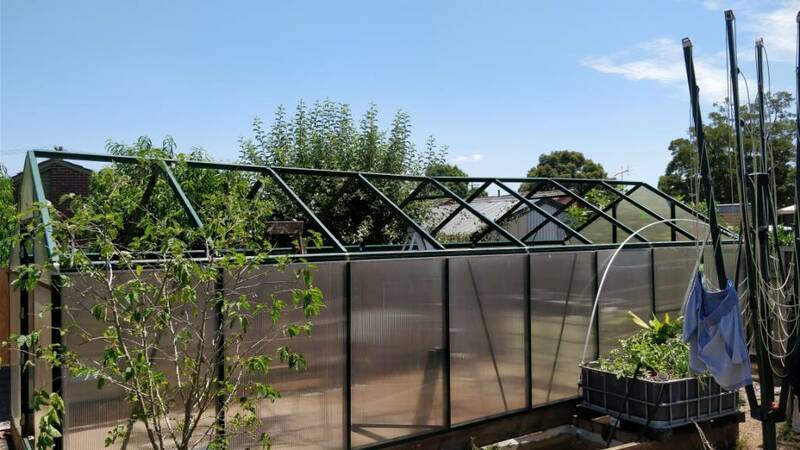 Okay I've dismantled my two systems and have decided to use a friends 8x3m greenhouse. 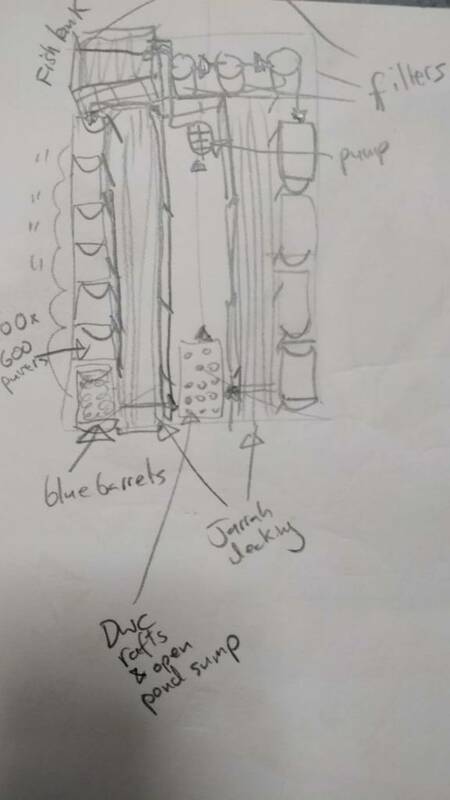 Currently I have a design in mind of blue barrels down the sides cut longways (which I would rather use for ease of cleaning and less media capacity because I'm buying clay balls and don't want to break the bank). 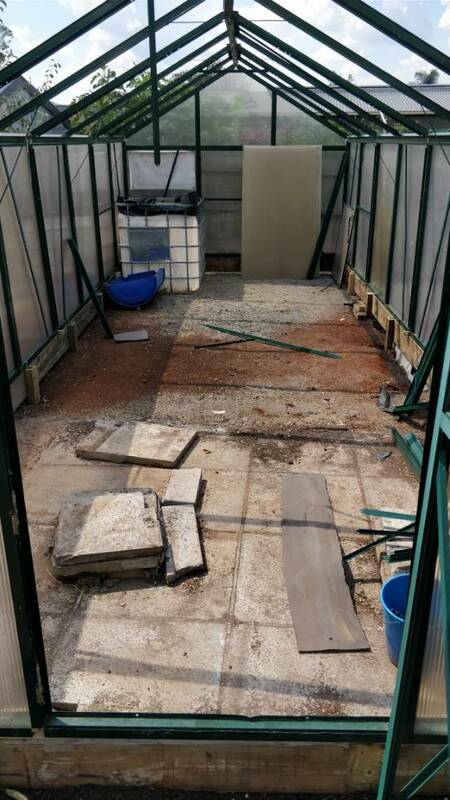 I will have 1 or 2 IBC fish tanks at the end of the greenhouse on the North side and a fully buried sump tank or 2 on the outside which I've already got 2x half buried ones, so using the holes would mean less digging. 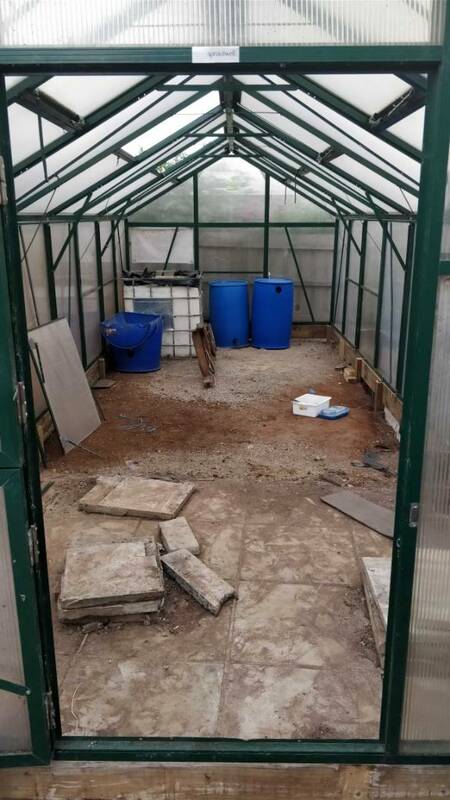 I could change one side of the greenhouse to barrels sideways rather than longways to make more grow room. Or I could run a 3rd row down the middle. uniseals or bulk heads in the barrels into 90/100mm return pipe to sump. What are peoples thoughts on this design. Ok I give up, what happened to the other systems? As for your design, less media means less plants. Any reason for using clay pellets instead other media Jay? Easy planting and translpanting, cleaning. After so many years of running trout to capacity with just an RFF, they have become clogged up and also there is this fine gloop at the bottom (Scoria dust and gunk). The barrel system just wasn't producing, maybe a nutrient problem or some locked up lime somewhere. I would stay away from a row down the middle. I think it may work best if you put 3 or 4 barrels in a row with aisles between, leaving one access isle down the side. Maybe split that to two rows with an aisle down the middle - easier access but more plumbing. I tried to show this by outlining proposed barrel locations in red. If you shift your FT to one side you could even get another row of barrels along one wall. At the end you can fill the aisle with a barrel or two since you don't need the aisle there. 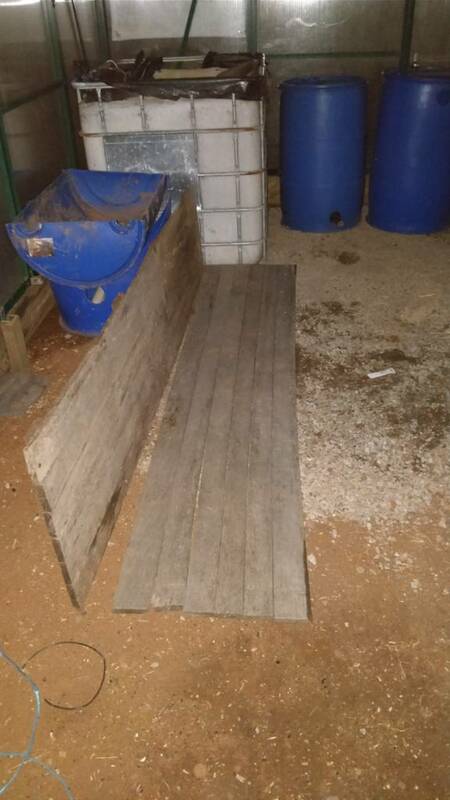 I show the center aisle proposal with barrels on either side, but plumbing may be easier if you group all barrels together in rows and keep the aisle to one side as long as your okay with the low ceiling side aisle (doesn't apply unless it's a hoop-house). 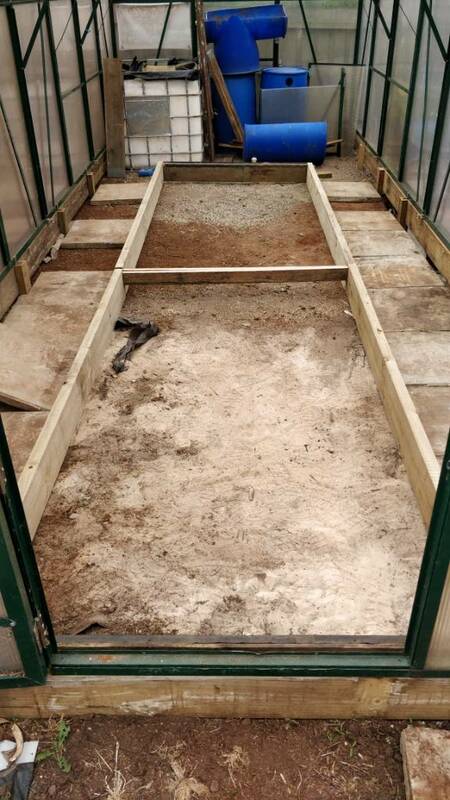 do you switch over to a DWC for bulk of the grow space surface area ? That would suit a long run either down side or two side by side down middle. But that would then require an alternate filtering. Drums are not an ideal DWC (straight sides would be better for the surface area ratio), but they would work. Forget the polystyrene rafts and go with acrylic/polycarb cell roofing or something similar resting on top. Could then even go with couple full size media drums upright (then less space required for 200L) primarily for bio-filtration volume. and may not need the clay balls that way - might allow for lower cost media option. (depends on how stocked and dirty your fish load will be - might need a flush option at bottom of drum). 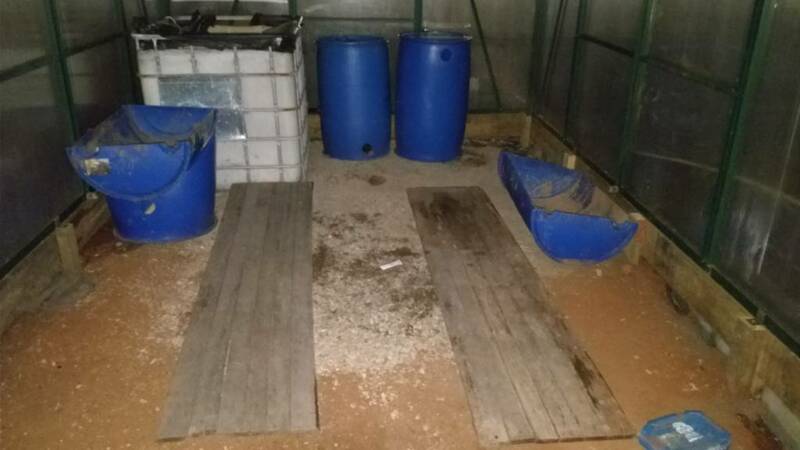 In terms of height I'd rather walk down the middle and have beds on the sides - I could do an IBC or 2 of DWC and have the barrels drain into them. Wow oh wowo! So happy to see you back, Jayendra. You always have a ton of cool projects happening. What a great looking greenhouse to play with. Mind if I ask for more information about the reasons you decided to do a greenhouse? This is looking north - so I thought fish tank and filters down that end where the neighbours fence shades in winter. As you can see from the barrel on the side there will be plenty of walk room in the middle so I might run an IBC row down the right side and do DWC. So what do people think of this design? That is looking pretty good Jay. Great use of space and like the central sump come pond idea. 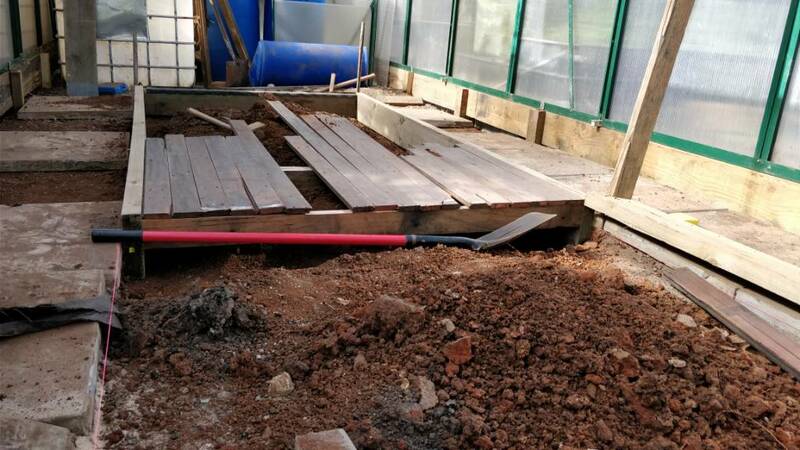 The decking is a good idea. Could also have a movable section if you ever need to place across centre to put things on etc. 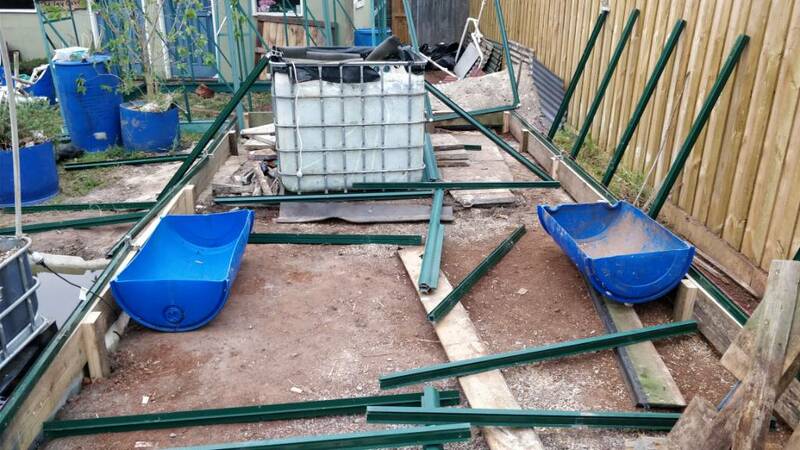 I'm going to have to keep the pond edge away from the sleeper walls, so as to not undermine the structure.